Don Getty played his entiere career with Edmonton from 1955 to 1965. For most of his career, Getty backed up CFL legend Jackie Parker, but he still saw a fair amount of action at QB. To take advantage of Getty's arm and Parker's speed, Parker would sometimes be shifted to RB while Getty took over the pivot duties. Getty's best season came in 1959 when he threw for 2080 yards on 198 attempts and had a 58.5% completion percentage. 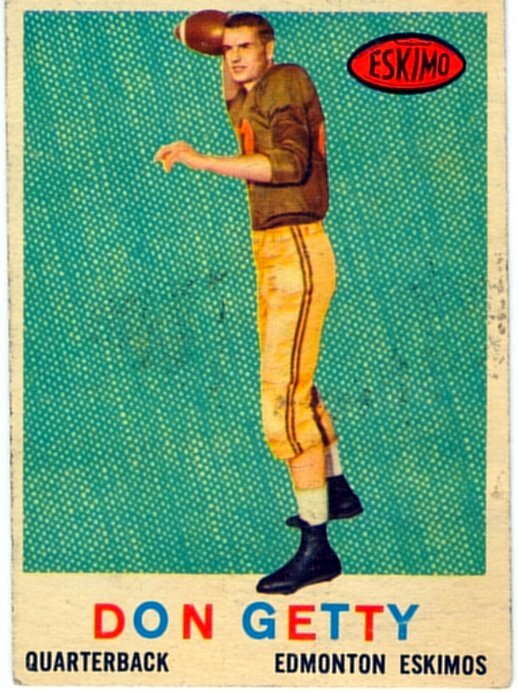 Getty was twice named as Edmonton's nominee for Most Outstanding Canadian (1957 and 1959), and was the runnerup to fellow Canadian QB Russ Jackson in 1959. As sucessful as Getty was on the field, he was even more successful after leaving football. Getty went into politics and became the eleventh premier of Alberta, serving from 1985 to 1992. No games played stats were kept in the West until 1964. * The Edmonton all-time roster lists Getty as playing for Edmonton in 1964, but he does not show up in the game participation stats. In 1954-58, the rushing stats included losses while passing. Getty had 2 fumble recoveries in 1955. These were likely OTF, but stats then did not distinguish between deffensive fumble recoveries and OTF fumble recoveries.